Justina Ireland is a science fiction and fantasy author and part time Harpy. 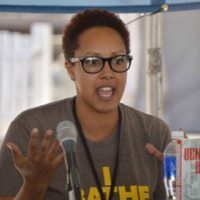 She’s an editor at Fiyah, a magazine of black speculative fiction, and the author of Vengeance Bound and Promise of Shadows. Her next young adult book, Dread Nation, which features finishing schools for aspiring zombie slayers and is set in an alternate 1880s America, will be published in 2018 by Balzer and Bray, an imprint of Harper Collins. Her adult debut, The Never and The Now, a story of diaspora and the fight for cyborg equality will be published in 2018 by Tor, an imprint of Macmillian. Think Battlestar Galactica meets 12 Years a Slave with a dash of the Musical Hamilton thrown in for fun. Because why not? You can find Justina at her website and follow her on Twitter.